Luxurious and upscale on every level, Celebrity Eclipse continues to set new standards in modern luxury vacations. Renowned for her contemporary décor and an extraordinary choice of dining options—you can also enjoy a wide selection of bars and lounges to suit every mood, almost endless entertainment from the impressive theater shows to the peace and quiet of the library, and variety of activities to keep mind, body, and soul in tune. 10 Night Cruise sailing from Vancouver roundtrip aboard Celebrity Eclipse. Sail Your Way - Book Before 01 May 2019! 7 Night Cruise sailing from Vancouver roundtrip aboard Celebrity Eclipse. 14 Night Fly, Cruise, Tour & Stay Alaska Hubbard Glacier Cruise onboard Celebrity Eclipse from Vancouver return including 3-star stays in Calgary and Vancouver PLUS Magnificent Mountain Getaway tour including 2 days onboard the Rocky Mountaineer Train! 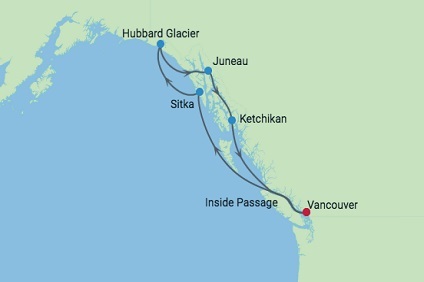 12 Night Fly, Cruise, Tour & Stay Alaska Hubbard Glacier Cruise onboard Celebrity Eclipse from Vancouver return including a 4-star stay in Calgary, a 5-star stay in Vancouver and a Rockies Express Tour including the Rocky Mountaineer! 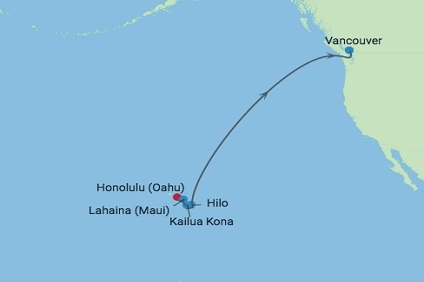 11 Night Cruise sailing from Vancouver to Honolulu aboard Celebrity Eclipse. 10 Night Cruise sailing from Honolulu to Vancouver aboard Celebrity Eclipse. 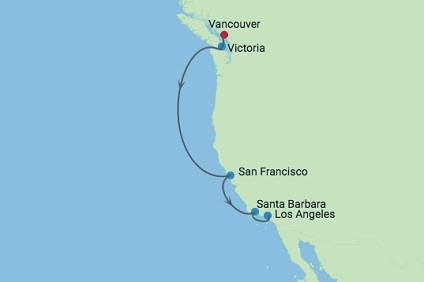 7 Night Cruise sailing from Vancouver to Los Angeles aboard Celebrity Eclipse. 15 Night Cruise sailing from Los Angeles roundtrip aboard Celebrity Eclipse. 9 Night Cruise sailing from Los Angeles roundtrip aboard Celebrity Eclipse. 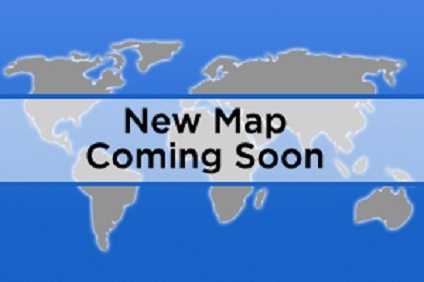 16 Night Cruise sailing from Los Angeles to San Antonio aboard Celebrity Eclipse. 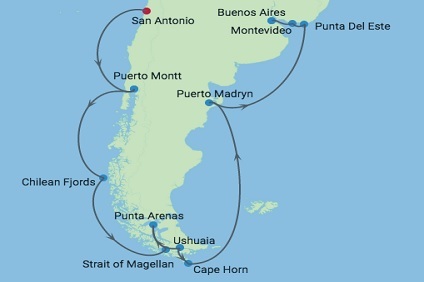 15 Night Cruise sailing from San Antonio to Buenos Aires aboard Celebrity Eclipse. 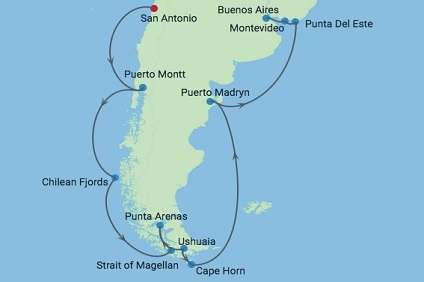 15 Night Cruise sailing from Buenos Aires to San Antonio aboard Celebrity Eclipse. 14 Night Cruise sailing from San Antonio to Buenos Aires aboard Celebrity Eclipse. BONUS OFFER^^ 17 Night Cruise & Stay South America & The Antarctic Islands Cruise onboard Celebrity Eclipse from Buenos Aires return including a 4-star stay in Buenos Aires PLUS Senor Tango Night including Dinner & Show & Wine Tasting at La Cava de El Querandi! 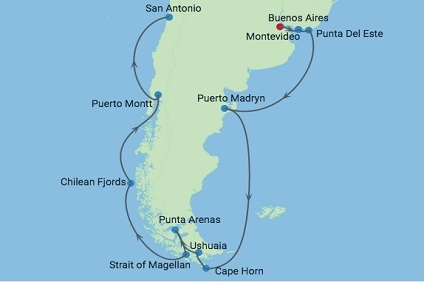 14 Night Cruise sailing from Buenos Aires roundtrip aboard Celebrity Eclipse. 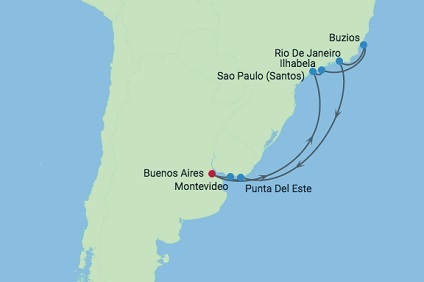 14 Night Cruise sailing from Buenos Aires to San Antonio aboard Celebrity Eclipse. Stateroom Features All staterooms and suites come complete with private bathroom, vanity area, hair-dryer, interactive TV, radio and phone. A2 - Aqua Class All staterooms include: two twin beds that are convertible to queen-size (unless stated otherwise) and sitting area, private mini-bar*, interactive Samsung flat-screen television system to view and select shore excursions, order room service, and watch movies*, private safe, and dual voltage 110/220AC outlets. (194 square feet, veranda 54 sq. ft.) AquaClass services include: daily delivery of bottled water and tea, priority check-in, express luggage delivery, priority disembarkation based on travel plans, and complimentary shoeshine service. Exclusive access to Blu, a specialty restaurant featuring “clean cuisine” that also serves complimentary, full-service breakfast every day. Upgraded room service menu. Amenities included are: complimentary access to the Persian Garden Aromatherapy diffuser, pillow menu, additional bathroom amenities, including shower gel, facial spray and lip balm, Plush Frette® bathrobes, slippers, oversized 100% cotton bath towels, and on-demand wellness programming including meditation and yoga. Stateroom features Hansgrohe® shower panel and fog-free mirror. *Additional charges apply. Stateroom Features All staterooms and suites come complete with private bathroom, vanity area, hair-dryer, interactive TV, radio and phone. XA - Guarantee Aquaclass All staterooms include: two twin beds that are convertible to queen-size (unless stated otherwise) and sitting area, private mini-bar*, interactive Samsung flat-screen television system to view and select shore excursions, order room service, and watch movies*, private safe, and dual voltage 110/220AC outlets. (194 square feet, veranda 54 sq. ft.) AquaClass services include: daily delivery of bottled water and tea, priority check-in, express luggage delivery, priority disembarkation based on travel plans, and complimentary shoeshine service. Exclusive access to Blu, a specialty restaurant featuring “clean cuisine” that also serves complimentary, full-service breakfast every day. Upgraded room service menu. Amenities included are: complimentary access to the Persian Garden Aromatherapy diffuser, pillow menu, additional bathroom amenities, including shower gel, facial spray and lip balm, Plush Frette® bathrobes, slippers, oversized 100% cotton bath towels, and on-demand wellness programming including meditation and yoga. Stateroom features Hansgrohe® shower panel and fog-free mirror. *Additional charges apply. Stateroom Features All staterooms and suites come complete with private bathroom, vanity area, hair-dryer, interactive TV, radio and phone. XC - Concierge Class All staterooms include: two twin beds that are convertible to queen-size (unless stated otherwise) and sitting area, private mini-bar*, interactive Samsung flat-screen television system to view and select shore excursions, order room service, and watch movies*, private safe, and dual voltage 110/220AC outlets. (194 square feet, veranda 54 sq ft) In addition our Concierge Class includes: Service- Included is priority check-in, priority disembarkation based on your travel needs, personalized concierge service, complimentary shoeshine service, express luggage delivery, main and specialty restaurant seating time preferences, and upgraded room service menu. Amenities- Included are complimentary welcome Blanc de Blancs sparkling wine, fresh fruit, fresh flowers, Plush Frette® bathrobes, oversized 100% cotton bath towels, pillow menu, extra handheld hair dryer, celebrity tote bag, personalized stationary, and use of binoculars and golf umbrella. Stateroom features a veranda and a Hansgrohe ® massaging showerhead. *Additional charges apply. Floor-to-ceiling sliding glass doors, sitting area with sofa convertible to trundle bed, privacy partition, 32" LCD TV, wireless connection, master bedroom with two beds convertible to queen size, second bedroom with one twin bed, bathroom with shower stall and washbasin. Additionally, suite veranda features lounge seating. Sunset Veranda Staterooms feature, floor to floor ceiling sliding glass doors leading to a veranda, sitting area with sofa, 32" LCD TV, wireless connection, vanity, two beds convertible to queen size, bath with shower stall and washbasin. Some cabins may have a trundle bed. Floor-to-ceiling sliding glass doors, sitting area with sofa, 32" LCD TV, wireless connection, vanity, two beds convertible to queen size, bath with shower stall and washbasin. Some cabins may have a trundle bed. Stateroom Features All staterooms and suites come complete with private bathroom, vanity area, hair-dryer, interactive TV, radio and phone. X - Guarantee Veranda All staterooms include: two twin beds that are convertible to queen-size (unless stated otherwise) and sitting area, private mini-bar*, interactive Samsung flat-screen television system to view and select shore excursions, order room service, and watch movies*, private safe, and dual voltage 110/220AC outlets. (194 square feet, Veranda 54 sq. ft) Amenities included are: robe, custom blended bath products (shampoo, conditioner and lotion), shower cap, cotton balls and cotton swabs, water/wine glasses, Celebrity eXhale™ bedding featuring custom premium mattresses, plush duvets and pillows and 100% pure Egyptian cotton linens, and hair dryer. Note: 2C Veranda Staterooms have partially obstructed veranda views, and 2D Veranda Staterooms have obstructed veranda views. Staterooms with an upper bed and sofa bed that sleeps two accommodate a maximum of four guests. Veranda Stateroom #7288 has a sofa and accommodates a maximum of three guests. *Additional charges apply. Ocean view window, sitting area with sofa, 32" LCD TV, wireless connection, vanity, two beds convertible to queen size, bath with shower stall and washbasin. Some cabins may have a trundle bed. Stateroom Features All staterooms and suites come complete with private bathroom, vanity area, hair-dryer, interactive TV, radio and phone. Y - Guarantee Ocean View All staterooms include: two twin beds that are convertible to queen-size (unless stated otherwise) and sitting area, private mini-bar*, interactive Samsung flat-screen television system to view and select shore excursions, order room service, and watch movies*, private safe, and dual voltage 110/220AC outlets. (175 square feet) Amenities included are: robe, custom blended bath products (shampoo, conditioner and lotion), shower cap, cotton balls and cotton swabs, water/wine glasses, Celebrity eXhale™ bedding featuring custom premium mattresses, plush duvets and pillows and 100% pure cotton linens, and hair dryer. *Additional charges apply. Sitting area with sofa, 32" LCD TV, wireless connection, vanity, two beds convertible to queen size, bath with shower stall and washbasin. Some cabins may have a trundle bed. Stateroom Features All staterooms and suites come complete with private bathroom, vanity area, hair-dryer, interactive TV, radio and phone. Z - Inside Stateroom Gty All staterooms include: two twin beds that are convertible to queen-size (unless stated otherwise) and sitting area, private mini-bar*, interactive Samsung flat-screen television system to view and select shore excursions, order room service, and watch movies*, private safe, and dual voltage 110/220AC outlets. (183-200 square feet) Amenities included are: robe, custom blended bath products (shampoo, conditioner and lotion), shower cap, cotton balls and cotton swabs, water/wine glasses, Celebrity eXhale™ bedding featuring custom premium mattresses, plush duvets and pillows and 100% pure Egyptian cotton linens, and hair dryer. *Additional charges apply.